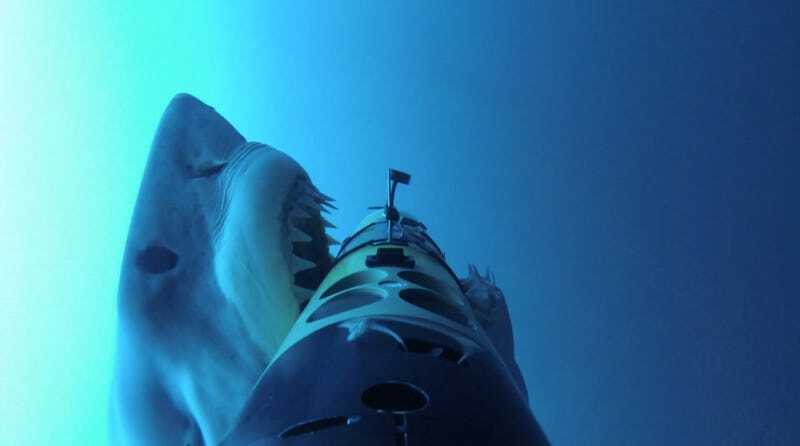 Last year, a research team from the Woods Hole Oceanographic Institution deployed a robotic "SharkCam" off the coast of Mexico's Guadalupe Island to film great white sharks in the wild. But the sharks had other ideas. The underwater vehicle, called REMUS, was basically a swimming torpedo outfitted with five cameras: one that faced behind the 'bot, and an array of five that faced forward. Combined, they provided a panoramic view of the sharks' world. It was also outfitted with a guidance system that received signals from acoustic tags that had been attached to the sharks. REMUS could then hone in on the signals and follow the sharks without any human intervention. But the best best laid plans of mice and men, as they say, often go awry. Because OM NOM NOM. If you watch closely, you'll notice that the shark protects its eyes whenever it crushes its jaws down onto the vehicle. The small flap of skin that covers the eye is called a nictitating membrane, which protects it from the thrashing-around of its panicked prey. Also notice that the sharks give up after a few good chomps, once they realize that they're not actually tasting any delicious seal. Though that's not before inflicting some serious damage. While the researchers didn't necessarily expect to film predation events from the POV of the prey, this footage is giving them a one-of-a-kind look at the way these elegant hunters do what they do best: munch on smaller mammals.